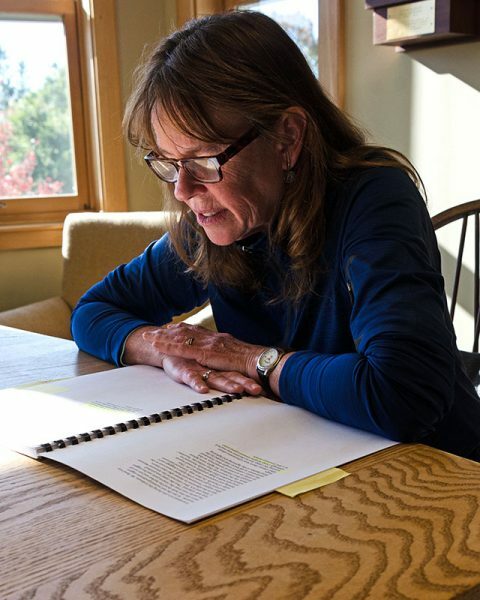 Maureen Fournier is an Acadia National Park seasonal ranger (you may have met her on duty at the Village Green in Bar Harbor), a former medical librarian, and a volunteer researcher at the MDI Historical Society. We met at the Northeast Harbor Library on October 20, 2017 to talk about her work on the Champlain Society. It was a perfect fall day, although it felt more like September than late October: 59ºF (15ºC), bright sunshine, light breeze, and a cloudless blue sky. Maureen and I had never met in real life although we’ve been Facebook friends for a while, so we began by chatting a bit about mutual friends, the historical society, the joy of poking around in archives, and eventually, we worked our way around to the Coast Walk. Jenn: Right now, I’m at Robert’s Point, the east side of the harbor there, kind of coming around the point into the harbor. 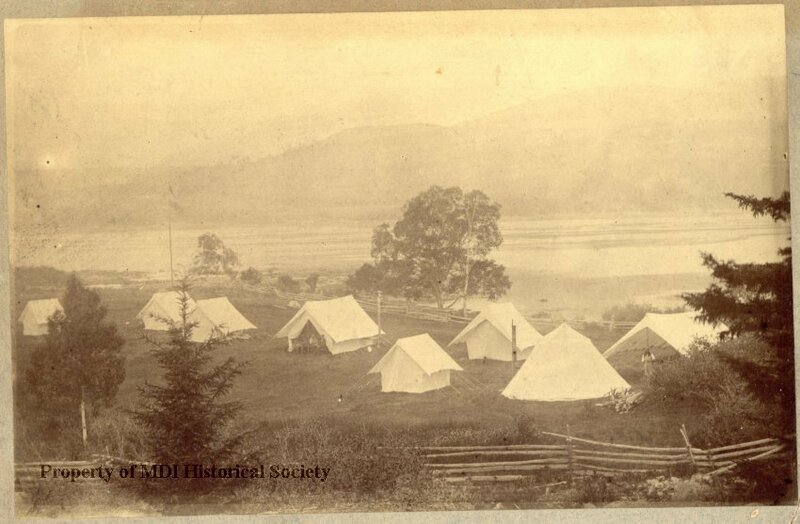 Maureen: You’re getting very close to the second camp for the Champlain Society [Ed.note: near the Asticou Inn]. … The first one … is over off Sargeant Drive, on the Sound. … Hadlock Brook comes down there. … That’s on private land. You’ve probably heard the name Catherine Schmitt (see bibliography), … she’s really the expert on everything to do with the Champlain Society, but the two of us were recently talking, and she said, “You know, I’d really like to trace that trail that they take from Lower Hadlock Pond down,” which is now through the golf course basically, to the stream, to the camp. Jenn: That would be cool! Jenn: It doesn’t hurt to ask. … Most people here are really interested in the history of the island. I’d say probably 80 percent of the people who I actually reach, say yes. Maybe even more. The people who say no are the ones who are really concerned about other people trespassing. Maureen: It might be a gateway for some other people to think they can go ahead and do that as well? Jenn: So, you’re a park ranger? Maureen: Right. I’m the ranger at the Village Green in Bar Harbor. I’ve been doing that for about eight years, but before [that] I was a medical librarian for 25 years. Jenn: Oh my gosh. No kidding. Maureen: My heart is with libraries, and national parks, and the outdoors. 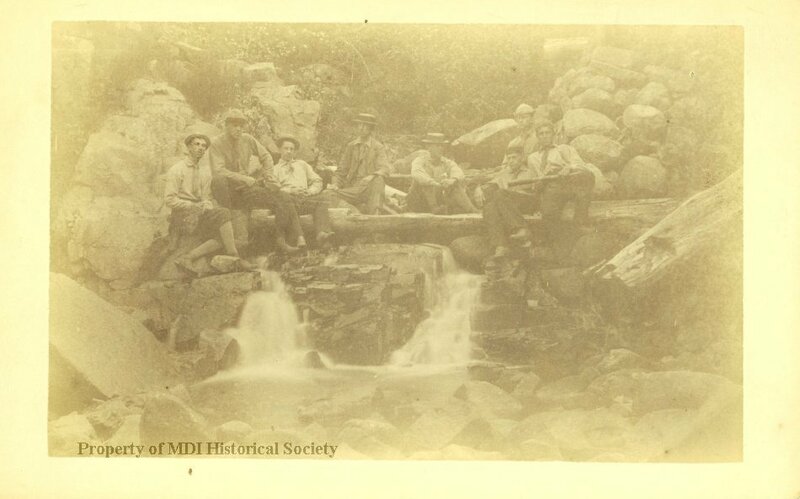 I got involved with MDI Historical Society just on a whim about four years ago. This is my home library, the Northeast Harbor Library, although I use them all. 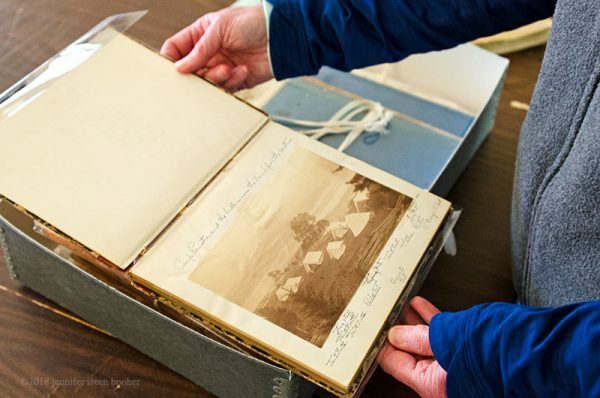 Brook Minor was here, and she got a grant through the Maine Humanities Council … to digitize or to add content to Maine Memory Network – I don’t know if you’re familiar with Maine Memory? Jenn: Oh yes, that’s an incredible resource. Maureen: [When that ended] … I said, “Look. I’m relatively free in the winter times. I would love to get involved on a volunteer level with something like this.” Next thing I know, I’m on this path with the Champlain Society, who I’d never heard of before. Met Catherine Schmitt. 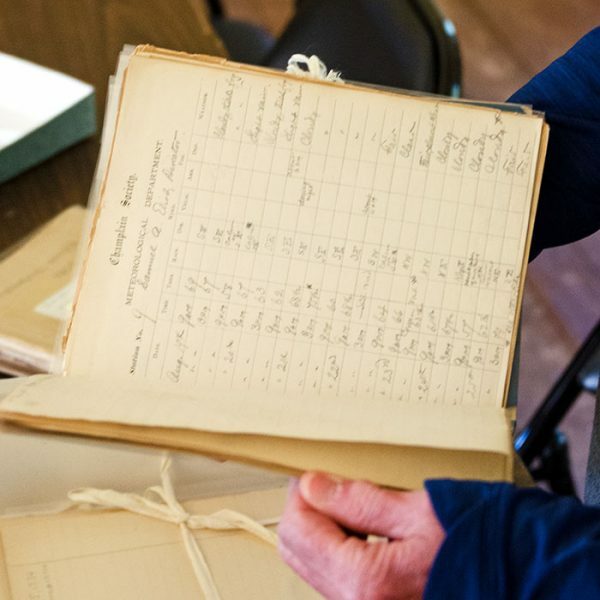 Then we started talking with Tim [Garrity] over at the Historical Society and realized that … there are 16 log books of the Champlain Society [and] they were not in a format yet that would be acceptable to Maine Memory Network. … That meant starting from scratch. Scanning them all. The transcripts have to be redone according to standard. That’s when I started working on that. 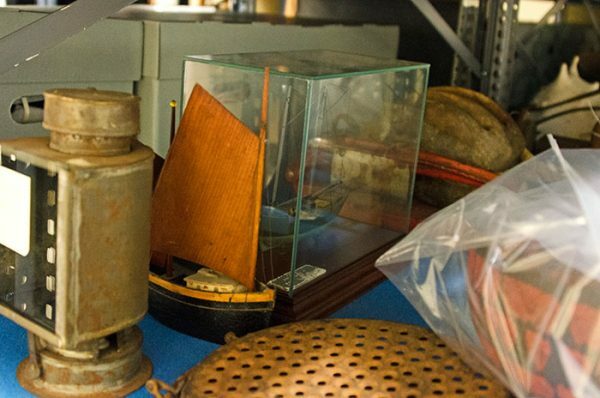 I don’t know if you’ve been on Maine Memory Network lately or on even the MDI Historical Society website. A good number of the log books are up there. Jenn: I’ve been poking around through them. It’s amazing. They’re beautiful. You guys did some really high quality scans on those. You can really blow them up and look at the detail. Maureen: I’m still working on it. There’s one right now, I just [started] Wednesday at the Historical Society. … There’s seven or eight log books that [aren’t done] … The handwriting is difficult to read. … It’s fascinating. The stories. They laugh at me over at the historical society, because I just love these Harvard boys. I think they are the most fun group. You know how you get the college essay questions sometimes, ‘If you could have an interview with anybody, who would you like to [meet]?’ I would love to meet with one of the Champlain Society members. Jenn: I want to go over to the camp and hang out around the fire with them. Maureen: Their stuff was amazing. Right now, Catherine Schmitt is working on a book on the Champlain Society. Jenn: Yes! Which I use a lot. Maureen: Me too. I’ve got one hanging in my dining room. When you think about their contributions in citizen science, that alone gives them an incredible reputation as far as the history of the island. Then, they were just fun. They gave us a look, just a little bit of a look into society in the 1880’s on the island, and I look at the log books from the point of view of a very amateur historian. For instance, I knew of the story of a Mr. Howe who had been robbed in his buckboard, coming down from Green Mountain, which is Cadillac Mountain. Maureen: I knew of that story, but then to read about it as an account in the Champlain Society logbook. “Oh yeah, Mr. Howe was robbed.” Before, it could have been just urban legend. Just a story that had been passed down through oral histories, but then to see [it recorded in the notebooks], it actually happened. It’s a major, primary resource. … I do a lot of hiking on the island, and I hike a lot on the western side. I did not know there was a major fire over there in 1883. Maureen: Major fire. They could see it from here in Northeast Harbor. There were three or four days of entries that talk about the fire and what they could see. Oh, Garfield assassinated. Jenn: That’s in the log books? Maureen: That’s in the log books. 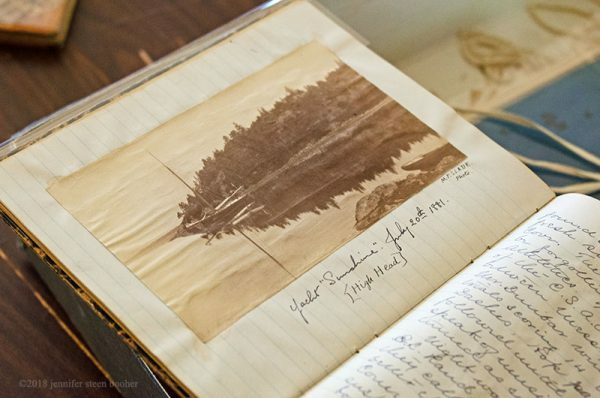 “We picked up the paper in Southwest Harbor today and read of the shooting of President Garfield.” Actual historical accounts in their writing in the log book, I find … that’s … wow. That’s pretty incredible. Jenn: From the little poking around I’ve done, it seems like they have a really irreverent sense of humor. Maureen: Oh, that’s what I mean. I would love to sit down with them in their parlor tent and just listen. Jenn: It gives you a real sense of them as people. Jenn: Not just as people, but as people at that [age] … college kids, you know? That point when you’re kind of an adult, but you’re kind of not yet. Maureen: Right. I mean, it wasn’t all scientific research that they were doing. … These were young men. …They were the first campers, really on the island. They were thought of as a little exotic and strange. Maureen: Oh yeah, the barbarians. Jenn: But the Harvard barbarians – barbarians with a pedigree. Maureen: Exactly. Interesting group. And then the group changed from year to year, so you had a new mix of humor, of conversation, of backgrounds; they put on plays, they were very involved in the social life here, so you have an up-front, personal look at society. On many levels, [the logbooks] are just a wonderful resource into that day and age. Jenn: One of the things that I’m interested in is … this sense that they were kind of seminal. There were a lot of connections coming out from the Champlain Society. The houses that got built and the people who came here because the Champlain Society had been here. The Eliots came first, and then they brought friends. Their friends grew up and got married, and some of them settled. Well, didn’t settle, but they had summer places here. Maureen: Right. Rand probably was the one that came back the longest period of time. Towards the year 1890, he was still compiling information on the island and especially the flora and fauna, and at that point, they were no longer camping. They were more involved … they were grown up now. In some of the later log books, … [Rand] was staying at the Central House in Somesville. He used that as a base, so you can see the difference between when they were in canvas tents [as college students.] Ten years later, now they’re grown up. Now they’re married. They’re spread out more. Toward the end of that decade of the 1880’s, their work wasn’t as prolific as it was in the beginning. In the beginning, it was a club broken up into divisions, and departments, and there was a captain. There was a secretary. They got together over the winter to plan the upcoming summer. They have logbooks of their meetings in Boston. And even [in] those records, you can see the progression of their maturity from being kid-like … with a club, up to more citizen science, and then more involved in general society. It was a nice, easy progression. You could see the development of them as individuals, and of them as a group. I love reading their records from when they met over the winter time. They’d sometimes get together at hotels. There’s a hotel in Boston called Young’s Hotel. … They actually had menus set up for the event, and they had agendas. They were very, very particular and detailed about what they were going to do. Jenn: How many of them were there at that point? Maureen: … The membership changed. Generally, it was about a dozen in each summer’s event. Some didn’t stay the whole summer. Some would only pay for [a few weeks] … They each had to pay their individual way. That’s in the log books as well. There’s an accounting. Maureen: There is a treasury of the group, and there’s an accounting of how much the tents cost to rent, and storage, and the food. They also had a yacht called the Sunshine. That [belonged to] the Eliot family. In the early days, in the first camp at Camp Pemetic, which is the one on the Sound, some stayed on Sunshine right off shore. They used that and a dory to go back and forth [to] Southwest Harbor. 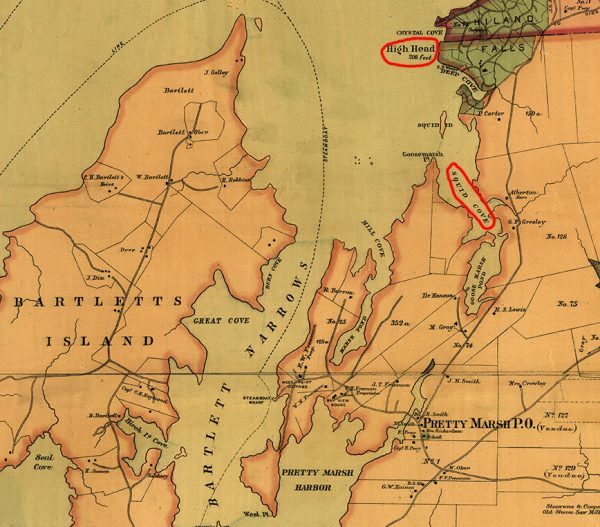 They did not use Northeast Harbor as a base, as a place to shop, or to get provisions … Southwest Harbor was the major town and settlement at that point. Maureen: Was the leading or the largest. Maureen: Yeah. … I mean, that’s true. I think Hancock Point was another area that our visitors would land in. They’d take the train up the coast from Rockland, and they’d get to Ellsworth and take the train to Hancock Point … That’s when Bar Harbor started getting up and coming. Before that, you’re right, Southwest Harbor was it. There were steamships that went up the western side, so Seal Cove, Goose Cove had a landing from Ellsworth and Bangor. Maureen: There were ships that would land on that side. Jenn: I’m going to have to look for that. I had no idea. Maureen: Yeah. I know. 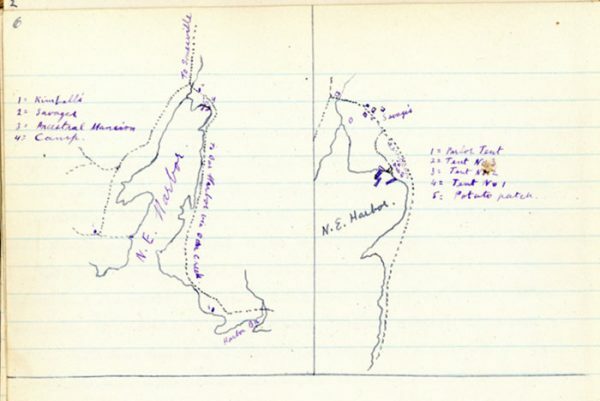 In transcribing some of these log books, they would have place names mentioned in them, Goose Cove being one of them. The other place that I [noticed was] … Squid Cove. Both Catherine and I [researched] where that exactly is on the map. [Since I didn’t know where Squid Cove was, either, I’ve included a map for you. Oddly enough, Edward Rand’s own map shows it as Goosemarsh Cove, even though earlier and later maps call it Squid Cove.] Detail of “Mount Desert Island,” Colby & Stuart, 1887. There’s a dotted line showing the steamboat route. Maureen: A lot of it’s on private land now, so you can’t access it. There are some wonderful photographs also in these log books. They’re on Maine Memory Network as well. One of the photographs I remember was up in the Squid Point area called High Head. It was a destination for people coming from the east side. They would take their buckboard over, or they’d walk. I mean, visitors then … I call them visitors, but they’re mostly summer residents. They would walk, much more than we do today, and there were times in fact, the Champlain Society would walk from Northeast Harbor, all the way up into what is now Somesville and come down the other side and [it would] take them half a day to walk over there. Then they’d take a boat back over to their camp. Getting back to High Head, that was a destination, and there are some photographs of them and entries in the logbook about, “Oh, we’re going up to High Head today and enjoy a picnic.” Or something. That’s the time period. There’s a lot more walking. … They walked all [over] … doing what you’re doing actually. I was thinking about this. They were walking from Northeast Harbor, along the shore, up into Otter Creek and up along what is now Ocean Drive, out to Anemone Cave. Jenn: That is a long walk! Maureen: … They mentioned some of the hotels in Bar Harbor, that they would stay there. Jenn: I’m just trying to think, in 1880 a lot of those shore paths weren’t there yet. Those were more the 90’s. Maureen: [They would have taken] the road, rather than trails. … They would probably be going up right along what was the county road through Seal Harbor and not turning off onto Cooksey Drive. Jenn: So, going the other way, through the mountain pass there. Okay. Maureen: Yeah. There’s an old county road that cuts through Otter Creek … I found traces of this county road in Seal Harbor. Jenn: Yeah. It used to run through where Blackwoods is now. Down to where the Causeway is. There was a bridge occasionally. Maureen: You know when you’re going through Otter Creek … I don’t know if you noticed, right on Route 3 there, off to the right, as you’re heading north towards Bar Harbor, … you can almost trace an old road after the village of Otter Creek, heading towards Otter Cliff Road. You can see kind of an old road bed through there. That was the main thoroughfare through what was called the Gorge. You can see also traces of that old county road. I think there’s a road called the Old County Road in Seal Harbor. Anyway, you can see traces of the old county road also before you get to Cooksey Drive. You know when you pass the lower Day Mountain parking? In those woods on your left, there’s traces of an old road in there. Maureen: It’s very cool. … They didn’t make a trail, but they did certainly make paths to where they wanted to go. The Asticou Trail, from Asticou to Jordan Pond House, that’s probably one of their earliest paths. Jenn: I’ve never walked that one. Maureen: … There’s a couple ways of accessing it. You could access it from Brown Mountain Gatehouse, but you could also access it behind the Thuya Gardens. There’s a path back in there that’ll take you up there. Then you get on Park property, and then it’s called the Asticou Jordan Pond Path. That was one of their earlier paths. There are paths up Sargent Mountain. When I’m hiking up Sargent, I’m always looking. I always wonder. This is the way they went or that was the way they went. I find it fascinating to be walking in their footsteps. … They were on Norumbega a lot, there’s some really funny stories about how they ended up in the blueberry bushes, ripping their pants and everything, coming down the east side of Norumbega, which they called Brown Mountain. I’m always looking for trails up on Norumbega because they were there in the Lower Hadlock Pond area a lot. That’s where they took their baths. I think it’s a water source now. Maureen: I’m trying to connect it all. Bring it forward. … Just make that connection with them somehow. That’s exciting for me. … The more I started digitizing and helping with the transcriptions, the more I started just falling in love with these guys. Maureen: Yeah. I think Rand has so much talent. He’s the one most people think of. And certainly the captain, who was Charles Eliot. He seems to me, always to be the more sophisticated … fell into that leadership role very easily. Jenn: Well, it was his boat. Maureen: It was his boat, and the “ancestral home” being here. … [Ed. note: After the Eliot family built a summer home here, the logbooks refer to it as “The Ancestral” or “Ancestral Mansion.” Collegiate irony circa 1884.] But he definitely was a natural born leader as well. Rand is – beyond his work with flora and the mapping – his creative writing, his poetry, his storytelling, he was multi-faceted. … You know what is mind-boggling to me, is the difference in the education systems between then and now. You think, these folks here, of course they went to Harvard and they were Boston Brahmins, you know, blue bloods. They had really good educations. But, at that point, they were also studying the Classics, which is pretty much nonexistent today. Rand especially would incorporate that knowledge base, that love of the classics into his storytelling. He would write pages and pages of stories, using mythological or classical names and stories. He would incorporate that into his story of the Champlain Society. … They were a wonderful mix of the arts and the sciences. Really, when you think about it, they were so well-rounded, in their writing, especially. I enjoy them. Jenn: I’ve enjoyed the little bit I’ve read so far. I’m really looking forward to diving into this. Maureen: Yeah. I think when Catherine gets this book done, it’s going to be great, because then it can be put out there on a much more accessible level. … This was a copy of what we transcribed for the 1882 log. … The reason I brought this is because he gives a description of their Camp Asticou here in Northeast Harbor and where it was set up. Maureen: There’s actually even a map, a little hand drawn map in the log book that I don’t have in here, but … You want me to read it to you? Maureen: This is Camp Asticou, which is the second camp they had. … So if you’re standing on the porch of the Asticou Inn … it would be a little to your left on the embankment there. Jenn: Did they bury it someplace? Maureen: They buried it back there somewhere. Maureen: But to me, it’s also the natural progression. For the previous two or three summers, they’ve been really enjoying this camping experience, and then it got old. … They were still in tents, but you can see how they’re growing up a little bit. They’re mingling into society and not escaping from it in a tent. Although, they’re still saying that having the road nearby is not a good thing. They still are maintaining they want some privacy as campers. Maureen: … I think 1882 and 1881 are the most interesting logbooks to read. 1881 because they were so focused on what they were doing here. They were much more meticulous and detailed in what they wrote about, so the content is much more involved. Jenn: Is that their second year? Maureen: It would have been the third summer. There is a logbook from 1879. That’s when Charles Eliot, the son, came up with the Sunshine, and there is a logbook of meteorological data, which is very interesting. I know the park has been looking at that for the climate change issue, you know? Maureen: … To see the changes meteorologically, … even the effect on the types of fish that were here, the flora and fauna that are here now, versus what was there then. These are huge resources in the science field. You know? Because it shows you right there what the difference is. The change in the number of species of birds from then until now. 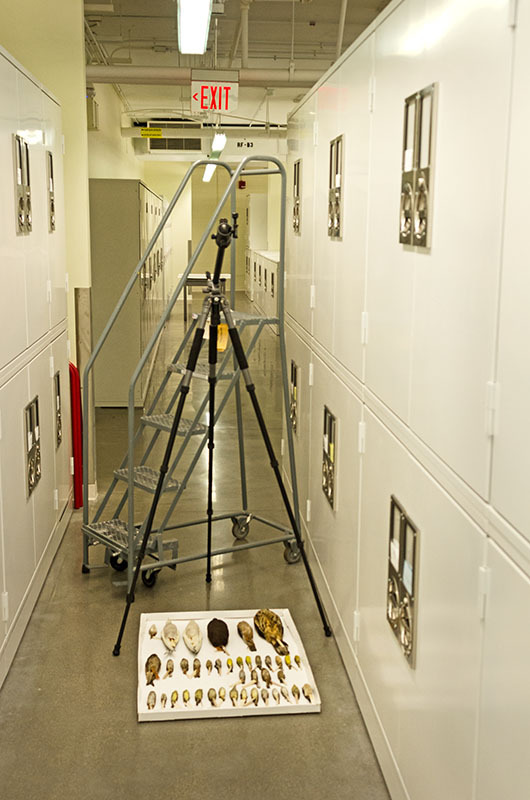 Catherine … has been recently down at Harvard, and in their Natural History Museum they have the actual birds from Spelman. Spelman Collection. Photo by me, but courtesy of the Museum of Comparative Zoology and ©President and Fellows of Harvard University because they have a crazy strict photo policy. Jenn: I’m actually going down to photograph them for her article. Maureen: Oh, you are? .. Tim did mention that you’re doing work for the next Chebacco, is that correct? Good. Yeah, your photographs are unbelievable. Maureen: She sent me a picture, and … she said, “You can’t imagine the feeling.” There she was with her glove and that warbler in her hand. ‘Oh my god, it’s Spellman’s bird.’ We get very excited about it. 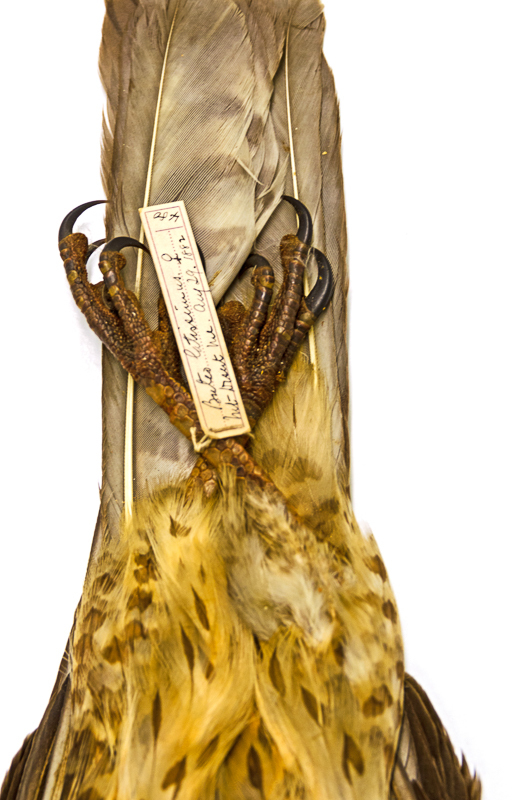 Spelman Bird Collection: Buteo latissimus, August 29, 1882. No.480. Photo by me, but courtesy of the Museum of Comparative Zoology and ©President and Fellows of Harvard University. Maureen: Exactly. It’s that connection between now and then that it’s … You’re right. It’s immediate. It’s a wow moment. 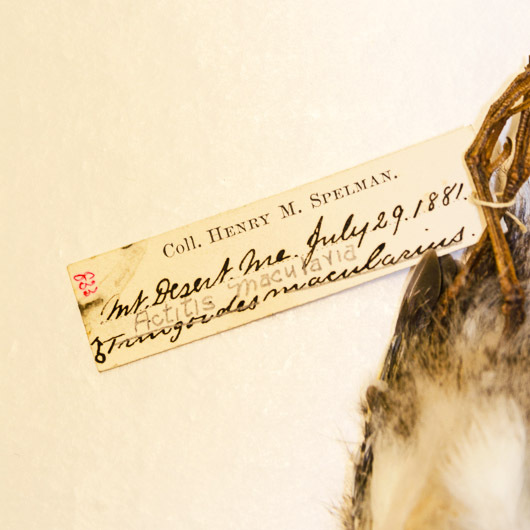 Spelman Bird Collection: Actitis macularius, July 29, 1881. No.833. Photo by me, but courtesy of the Museum of Comparative Zoology and ©President and Fellows of Harvard University. Jenn: It’s kind of the point of a history collection in a lot of ways. That wow moment. Maureen: Making it come alive. Not just sitting in a museum somewhere. It’s alive to me. 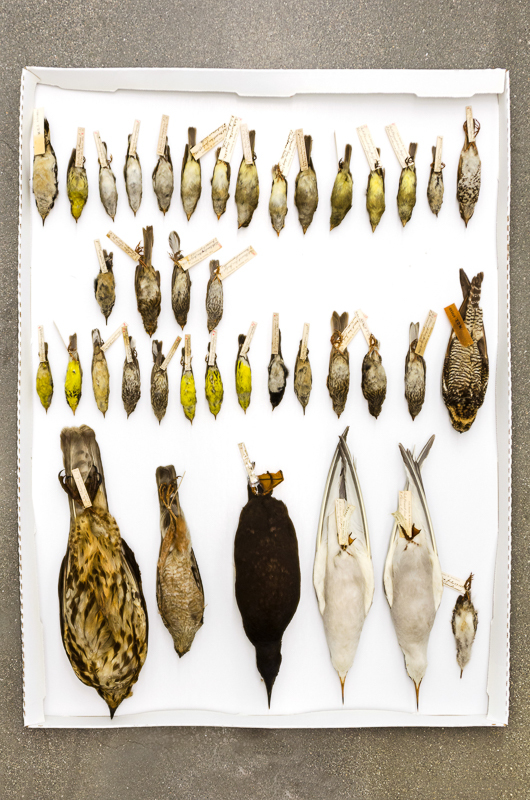 Jenn: You could probably find the entries that they wrote about each of those birds. Jenn: I can’t wait to see her article. Maureen: Yeah. I can’t either. She’s a very good writer. I’m blown away with the research that she does. I help with whatever I can or whatever she wants me to, but I love being involved with it. She’s definitely the expert on the whole thing. 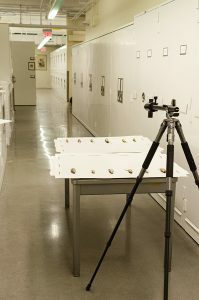 Jenn: I have to say, I’m really looking forward to this, partly because of the connection, but mostly because I get to go behind the scenes at a museum, and I get so excited about that. Maureen: Oh, I know. Exactly. I would like to schedule a trip down there. This reminds me, I got involved with Ron Epp on the George Dorr biography. [Ed.note: Creating Acadia National Park, The Biography of George Bucknam Dorr.] When I first started as a ranger, so eight years ago. … I was working as a volunteer in the interpretive division. Because of my interest in history, I was asked to conduct the interpretive program at Old Farm. … This was before the Champlain Society came onto my scene. I dove into everything George Dorr. I met Ron. I’m assuming you know who he is. Jenn: I know of him. I don’t know him personally. Maureen: Like Catherine is the expert on all Champlain Society, Ron Epp is … George Dorr, almost come to life. … He’s a former library director, and researcher, philosopher, he’s like a George Dorr in my mind. Anyway, he was the one I would go to for information so that I could … conduct this program. Then that started a friendship with him over the years, and then I got involved with his biography and helping him with that and doing some minor review of the manuscript. He asked me to write the forward for the book. … When he asked me, I was like, “Really?” Our friendship evolved. Of course, our admiration of everything George Dorr was what kept us very connected. This work for the Champlain Society is equally exciting to me. I feel like whatever I can do to push the whole story of the Champlain Society out for the public to see – I would certainly like to add that. Jenn: Well then, I definitely asked the right person. Maureen: I don’t know what I can do, but ask and I’ll let you know. Maureen: … We could go to the Asticou Inn, … [and then] drive over to The Sound, and I’ll show you that field. Then, if you want, make a quick stop at the Historical Society, and I’ll show you the log books. We hopped in our cars and headed for the Asticou Inn. Jenn: What a gorgeous day. 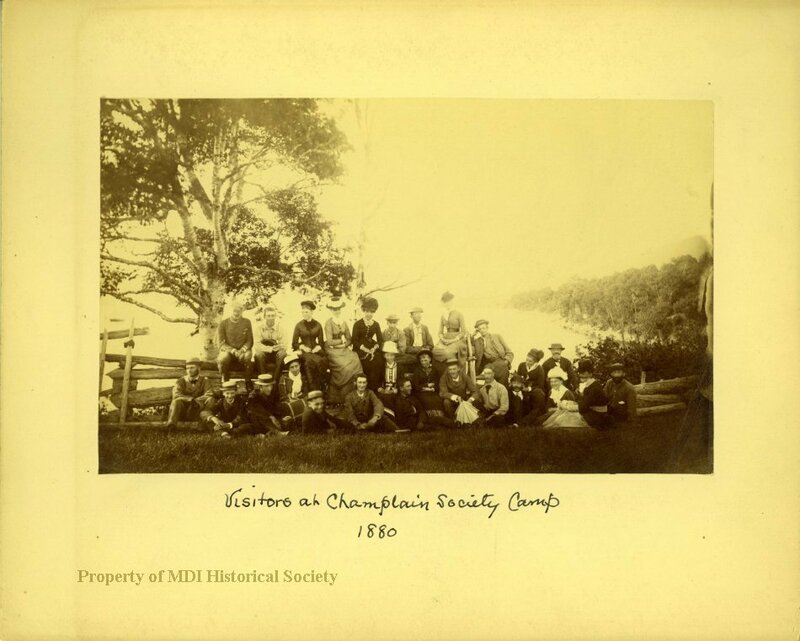 Champlain Society camp log, Northeast Harbor, 1884. 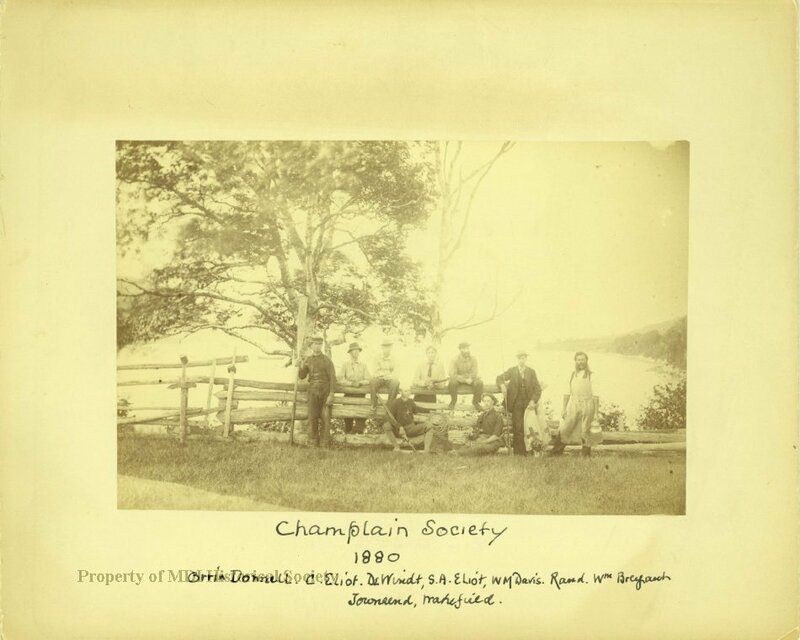 Photo taken by the Champlain Society, probably 1883. 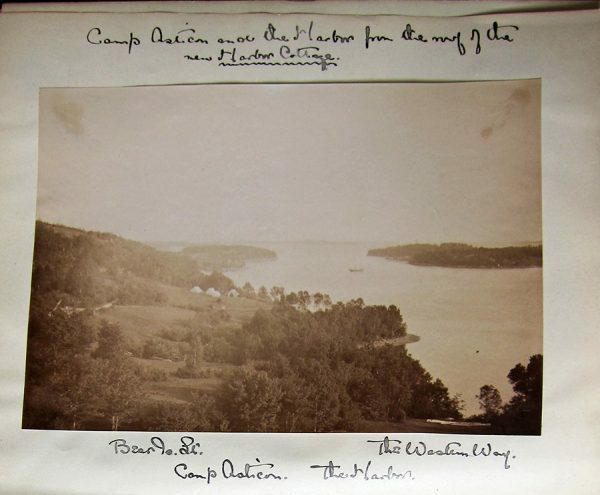 “Camp Asticou and the Harbor from the roof of the new Harbor Cottage.” The Harbor Cottage was built in 1883 and stood in roughly the same place as the current Asticou Inn (which was constructed ca. 1901.) Their tents appear to be down by the Shellheap property. 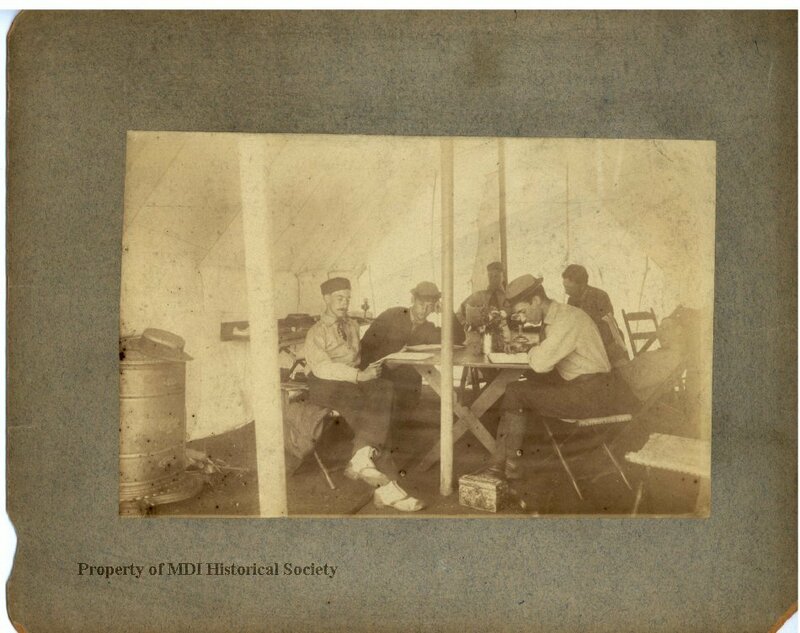 Photo courtesy of the MDI Historical Society. Maureen: You know they talk about, in a little hand drawn map, there’s Tent 1, Tent 2, Tent 3 and Tent 4. And Tent 2 maybe is next to this large boulder. What boulders are there now or were taken out when houses were built, I don’t know. But I want to say it was over in this area here, maybe a little further in that direction. Jenn: So it’s all woods now. Maureen: … I’ve never walked down in here so I don’t know. I need to research a little bit more where Savage’s Wharf was. Maureen: And then would this have been the potato patch? Do you know? I’m not exactly sure where it fits. Jenn: Have you talked to Sam McGee? Jenn: He … thinks that the camp was more or less on Story Litchfield’s property. … I think she’s the last private land before the Inn. Maureen: Okay. That would make sense. Then it talks about the gentle sloping, which is here. Jenn: Yes. That would have been very convenient for getting fed. Maureen: You know, I’ve sat here at various times during the summer, and looked out, and god, that bucket must be out there somewhere. Jenn: That would be such a score to turn that up if it hasn’t already been found. Maureen: Right. And like I said, I don’t know which house that was, or any of these houses, how old they are. I mean maybe Sam could shed some light on the history … I mean it’s probably pretty easily researched when these houses were built. Jenn: Well Sam definitely knows these up here. He is like an archive in his own right. Maureen: He’d be a great resource then. And he probably knows a lot about the Champlain Society as well? Jenn: Yes. Although, I think he comes at it from a different angle because he’s a Savage. Maureen: Oh, I didn’t know that! Jenn: Yes. Sam Savage McGee. So he’s got all the Savage history. Maureen: Nice. And that plays an important role in their Camp Asticou here. Because they talk about going to eat at “Savage’s” all the time. So which Savage is that? Jenn: But it’s before this building. I’m pretty sure. I’ll be getting clearer on that as I work my way up here. Maureen: I’ve never followed that angle. Jenn: Yes. We’ve got to get you and Sam together. Maureen: I don’t know anything really about the Savage family tree. I know there’s a lot to it. Jenn: The Savages are fascinating people. Maureen: And I haven’t touched on that at all, so that would be a whole other ballgame So, which of the Savages did all the buildings? Jenn: Fred. So, he’s the son of the guy who built the inn. Which was AC. Maureen: You know who’s also very good with Savage history is Linda Thayer. Jenn: I don’t know her. Jenn: Finding places where they overlap. Jenn: Well, in a way that’s kind of what I’m trying to do is tease apart all the layers, as I do this walk, to find everything that happens in this one spot. Maureen: So, this would’ve been Camp Pemetic. Jenn: No kidding? … Who owns this now? Maureen: I think this is Maine Coast Heritage. … [Pointing across the Sound.] So, that would be Flying Mountain, and then, St. Sauveur and Acadia Mountain. And … Sunshine would be moored out here. That picture, that photograph of them sitting at the head of the brook, would be to our right. … So that’s the Jesuit Field, across the sound. Jenn: It’s not exactly easy. [Ed.note: the field drops in a steep, crumbly embankment to the shore.] … I mean you can get down, but it’s quite a scramble. Maureen: Yeah. And they don’t really mention access. … It seemed like it was an easy walk, right to the boat. Jenn: How late in the season did they stay? Maureen: By Labor Day, they would be back at school. Maureen: Across that rocky ledge there, is the brook’s entrance into the sound. Maureen: And that would have been the general vicinity where they sat and posed for the one photo. You can kind of see it down here. It feeds into the Sound. We drove up to the MDI Historical Society headquarters at the old schoolhouse in the town formerly known as Sound [a story for another post.] Maureen pulled the box of logbooks from the archives and we went through the contents. Jenn: Gosh, these are just beautiful artifacts. Maureen: Yeah, and they’re getting pretty fragile too. That’s one of the other concerns we have, but another reason why we’re working so hard to digitize them so [there’s] less handling of them. Some of them are logbooks. Some of them are meeting records from their winter meetings back in Boston. This would have been Edward Rand’s, he was the secretary the first few years, his report for the year 1882 to 83. They have logs of the yacht, so that would have been separate. Also in the same year they would have meeting records and more yacht’s log. This one is a good one, because it also has photos in it. The 1881. Maureen: So there was where we were, Camp Pemetic. … [Here’s a] summary of expenses. Maureen: Some of these little blue books [are] meteorological records. Maine invertebrates. They were very thorough and meticulous about their record keeping. This one is kind of a beast to transcribe. Jenn: I bet. … It must have taken a fair amount of work to make some of that faint ink readable in the scans. Maureen: Yes. You had to tweak it a little bit. … They are getting fragile. One thought is “What do we do about that?” Do we leave it because this is the original? Do we get them rebound? Maureen: I know. But definitely reduce the number of times handled. Jenn: Yeah. The scanning will definitely will help with that. Maureen: Yup. I think so. Jenn: And now that that’s done, you need a real reason to come see the original. Jenn: What an amazing project. Maureen: It’s fun. I mean you have to enjoy that kinda stuff, and I do. So let me show you where this is, in case you … do you want to look at it any further? Jenn: No. I don’t want to handle those too much. But it’s really cool to have seen the originals. … So many treasures back here. We took the box back into the archives storage area. Maureen: I know. Last winter Betsy and I were up here inventorying the larger objects. … This is what is left to be handled at some point. And what we would like to do … as far as the collection goes, is work with the textiles. Trying to make more room. Frankly I’m not sure how we want to handle the rest of [it]. Jenn: It’s like trying to curate someone’s attic. Jenn: Are these all trophies? 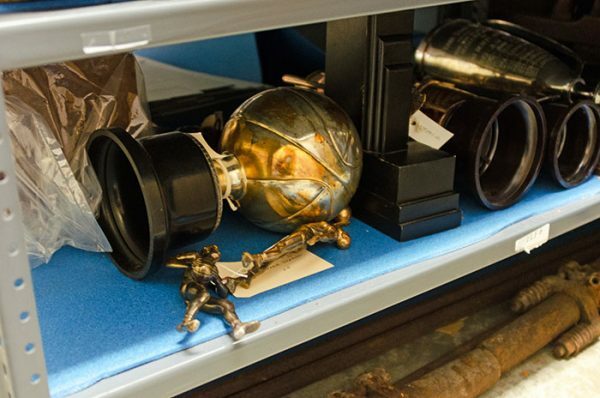 Maureen: … Bar Harbor high school trophies, basketball trophies. Jenn: What do you do with this stuff? Maureen: Well, that’s why I’m waiting for direction on that. … It should fall within the policy of the collection committee. What’s their relevance to the collection? Is there provenance? We always joke and say “Well, did … Abraham Somes have anything to do with it?” Anything with Somes’ name on it we keep. Jenn: Ah, look at all the little boat models too! Maureen: I know. And see that’s a thing I would need help with. Do we put that in a box? I don’t think so. Some of these things are not really boxable. So we’ll have to get some direction on that. I try not to get overwhelmed by it all. 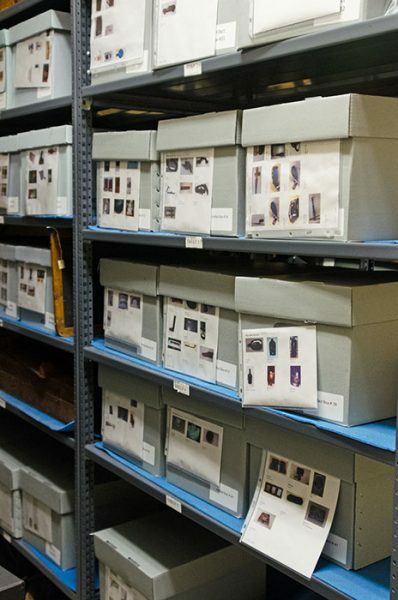 Those are the two rows that were filled with objects last winter. Now we’ve got a good number of them boxed. … So, I’ll maybe see you again in here. Jenn: Yeah, now that we’ve met we’ll probably start running into each other. Well, thank you so much for taking the time to show me all around. Maureen: Alright. Thanks so much Jenn. It was great. Jenn: And now we’ve finally met in real life! Maureen: It was beautiful weather and a nice day to share it. Epp, Ronald. 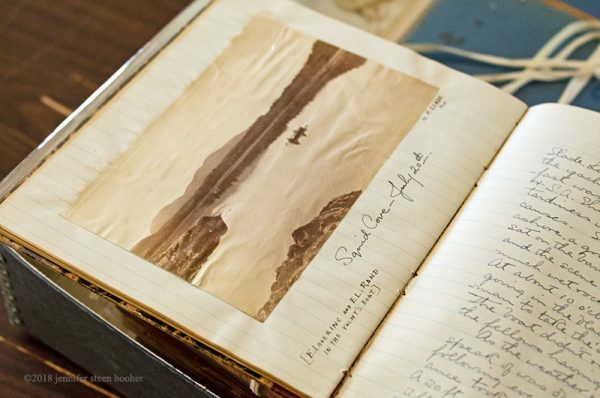 Creating Acadia National Park, The Biography of George Bucknam Dorr. Friends of Acadia, 2016. MacKenzie, Caitlin McDonough. “The Changing Flora of Mount Desert Island“, Chebacco, volume XVI, 2015. Rand, Edward L. and Redfield, John. Flora of Mount Desert Island, Maine. Cambridge: John Wilson and Son, 1894. 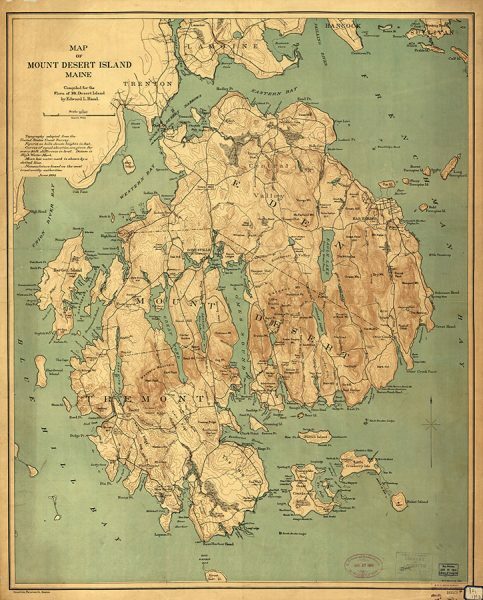 Rand, Edward L. “Map of Mount Desert Island, compiled for the Flora of Mt. Desert Island,” 1893. Schmitt, Catherine and Fournier, Maureen, “The Champlain Society Transcriptions,” Friends of Acadia Journal, Spring 2015. Schmitt, Catherine and Fournier, Maureen, “Acadia’s Nineteenth-Century Origins“, Spring 2015, Friends of Acadia Journal. Schmitt, Catherine, “Visionary Science of the “Harvard Barbarians”, Chebacco, volume XV, 2014. Schmitt, Catherine. “Youth as Conservation Catalysts,” Island Journal, June 2, 2014. http://www.islandjournal.com/articles/youth-conservation-catalysts/ Accessed March 22,2018. 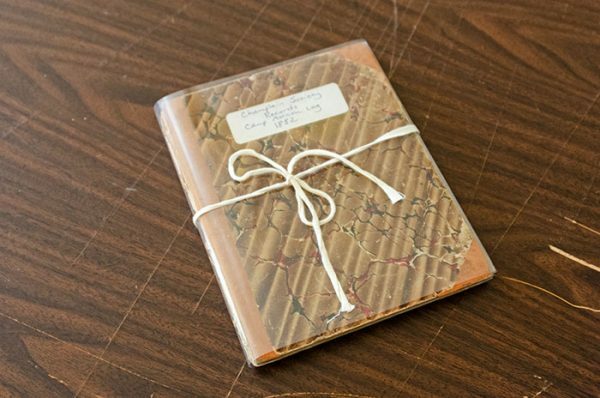 Though Maureen and I have repeatedly talked about the Champlain Society logbooks and her transcriptions on the Maine Memory Network, her conversation with Jenn brings new life to these fragile documents. Though I have not yet taken the final steps toward becoming George Bucknam Dorr, it tickled me to read Maureen’s account of the beginnings of our relationship. Since I have just discovered this blog, I now look forward to many armchair coast walks with Jenn!